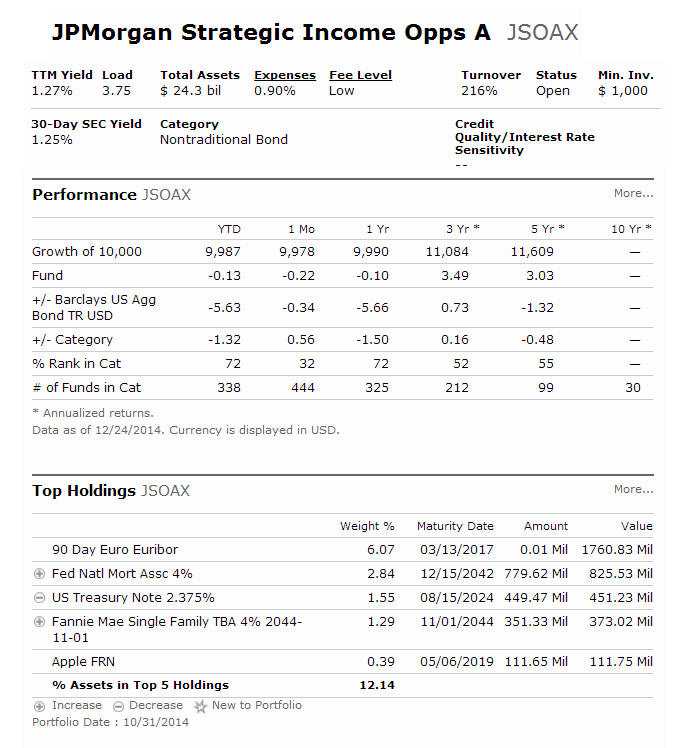 JPMorgan Strategic Income Opportunities Fund (JSOAX) is an actively managed bond mutual fund. This popular mutual fund seeks to provide high total return. It has an absolute return orientation and doesn’t manage relative to an index. This top JPMorgan fund invests in various debts instruments. It may invest in U.S. market, international market such as developed and emerging markets, and non-investment grade bonds (junk bonds). The fund advisor is J.P. Morgan Asset Management. The fund managers are William Eigen, Timothy N Neumann, and Jared Sherman. This non-traditional bond mutual fund has expense ratio fee of 0.90%. This investor class has 149814155 holdings. The class A has a sales load of 3.75%. Morningstar has ranked this U.S. stock fund with 2 stars and neutral rating. In 2014, the year-to-date return is 0.04%. This fixed income fund has returned 3.55% over the past 3 years, and 3.03% over the past 5 years. Top 5 holdings are Federal National Mortgage Association, MF 385 FIRST FLT 10/17, Apple Inc, 138 50th Street Funding LLC, and Embarq Corp. Top 5 sectors in its assets are cash, high yield, other, non-agency MBS, and bank loan. The bond average life is 1.57 years, and the average maturity is 2.77 years. The investment risks are interest rate risk, junk bond risk, international investing risk, future contract and derivatives risk, etc. This JP Morgan Fund is popular among investors. It has a high expense fee and the Class A has sales load of 3.75%.